Try the Encyclopedia Brown series by Donald Sobol if you enjoy mysteries but find reading them in English difficult. Each book contains about 10 short mysteries. They are written for children, so the English is simpler (and there aren't murders or frightening events), but the puzzles are very interesting. They give good clues that require you to pay attention and to think. Everyone calls 10-year-old Leroy Brown “Encyclopedia” because he reads a lot and never forgets what he reads. His father is the chief of police in their town, and Encyclopedia helps his dad solve the difficult crimes. 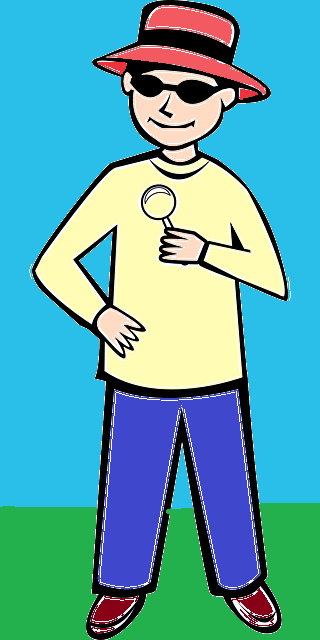 A sample case (from Encyclopedia Brown Solves Them All) is The Case of the Missing Clues. The neighborhood bully (a kid who beats other kids up and takes advantage of them) is Bugs Meany. Bugs took some cherries another boy was selling. When Encyclopedia questioned him, Bugs said he had bought the cherries at the store and eaten them in his clubhouse. However, when Encyclopedia inspected the clubhouse, including its trash can and yard, he didn’t find any cherry pits (the hard seeds we spit out after eating the cherries.) So he proved Bugs was lying. It’s a simple story, but well-written and funny. Most libraries in the U.S. (and maybe in some other countries) will have several books of the series available for free borrowing. Most are also available at Amazon for $4.99 (many for $ .01 plus shipping used, or $4.99 for a Kindle version). To get a feel for the stories, try "Look Inside" at Amazon here. (Click "First Pages.") A boxed set with 4 of these books is also available at Amazon for $13.57 (on the same page). I think you'll find these books fun. Read them to your children, or just to practice English yourself.